DC supply plug, female, 50A/500VAC, soldering Female EC3-F DC power socket. The connector has a nominal contact current of 50 A and a nominal voltage of 500 VAC. Plug, 4 pin, male, on conductor, soldering, straight DC plug with 4 pins for wiring, blck color, PC-MDP-402-4P. DC supply plug male, 50A/500VAC, soldering Male EC3-M DC power socket. The connector has a nominal contact current of 50 A and a nominal voltage of 500 VAC. List Price 2.70лв. VAT Incl. 2.56лв. VAT Incl. 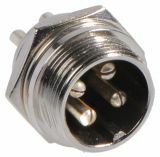 Connector, 6 pin, male, metal Plug with 6 pins for panel mounting. 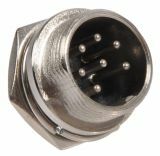 Connector, 8 pin, male, metal Plug with 8 pins for panel mounting. List Price 3.30лв. VAT Incl. 3.13лв. VAT Incl. Connector, 7 pin, male, metal Plug with 7 pins for panel mounting. Connector, 7 pin panel mount, male, metal Plug with 7 pins for panel mounting. 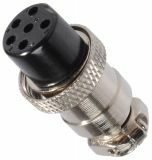 Connector, 2 pin panel mount, male, metal Plug with 2 pins for panel mounting. Connector, 8 pin panel mount, male, metal Plug with 8 pins for panel mounting. 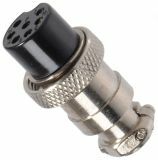 Connector, plug 7 pin, female, metal Socket with 7 pins for panel mounting. 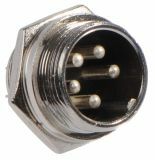 Connector, plug 8 pin, female, metal Socket with 8 pins for panel mounting. 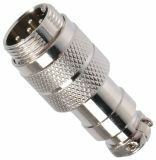 Connector 6 for volumetric mounting, plug, female, metal Socket with 6 pins for panel mounting. 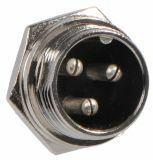 Connector, plug 5 pin, female, metal Cable connector, female with 5-pin for cable mounting. The clutch has a metal body which makes it extremely durable. 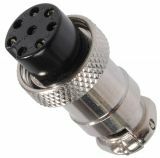 Connector, plug 2 pin, female, metal Cable connector, female with 2-pin for cable mounting. The clutch has a metal body which makes it extremely durable. Connector, socket, 4 pin panel mount, male, metal Cable connector, male with 4-pin for wall mounting. The clutch has a metal body which makes it extremely durable. Connector, socket 3 pin, male, metal Cable connector, male with 3-pin for wall mounting. 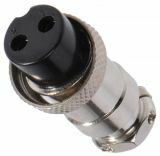 The connector has a metal body which makes it extremely durable. List Price 2.90лв. VAT Incl. 2.75лв. VAT Incl. 2.60лв. VAT Incl. 2.46лв. VAT Incl. Power DC socket, M, 5.5x2.5mm Power DC socket, M, 5.5 x 2.5 mm. Output terminals and connectors for DC in two colours: red and black, they serve as a banana socket. Vikiwat Ltd. also offers power sockets for DC and AC (network sockets), different types. D-Sub connector covers with different number of pins and much more. Huge variety of connectors at competitive prices and high quality. Register and shop online.